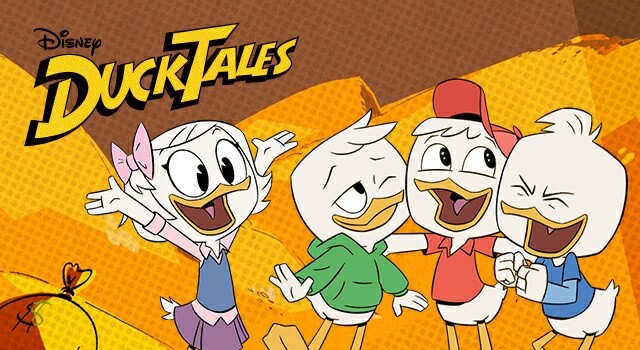 Even after watching five episodes of Disney’s new Ducktales (2017), the character designs in this reboot of Carl Barks product will take some time to get used to. They are not as cute as his designs and with the much beloved cartoon from the late 80’s / early 90’s. The duck family are fine, but the Bugle Boys, I’m sorry but they just too pug-like. My other issue is in replacing the voice of Launchpad McQuack. Terry McGovern is the one and only. Nobody can replace him and the jovial candor he imbued into the character. When news first broke about this remake, I was hesitant. Yes, I wanted to see new adventures. At the same time, I wondered who has the vocal talent needed to succeed in being the next Scrooge McDuck? I grew up admiring Alan Young. This actor provided decades of quality entertainment over the 70 years of being in this entertainment industry. He is the definitive Scrooge, and when he passed away in 2016, I wondered if he ever expressed his opinion on this revival. I’m sure that if he was still alive and saw the finished product, he would give his seal of approval to David Tennant. This natural talent burst into the pop culture scene with Doctor Who and since then, his enthusiasm can be seen in many a product. I particularly loved his work as Fujitoid in Teenage Mutant Ninja Turtles, and he’s the perfect choice to continue the Scrooge McDuck legacy. Despite seeing more than five episodes now, I’m longing for the original. It has a different flavour when compared to the original. The vibe is completely different. I’m curious in the fact on how one of the lads calls their uncle ancient and calls dibs on his fortune. This greed is anti Disney. The first episode dealt more with intros and dealt more with a slice of life. The narrative is certainly a reflection of today’s nuclear family. I am intrigued with Dewey’s curiousity about his parentage. He and his brothers have a mother who may later become part of the series. The father is nowhere in sight. A bit of exploration is offered in the intro of “The Great Dime Chase.” Della stole the Spear of Selene from Scrooge (revealed on “Woo-oo!”). The reason why is never explained and she may be a super spy given how incognito she has been throughout the other versions. 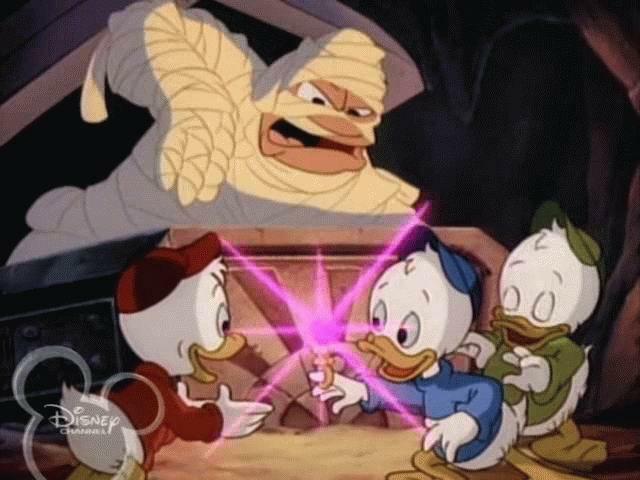 To keep them safe from harm, she may have entrusted her brother Donald and Scrooge became the kid’s guardians. An explanation is offered in a Dutch strip where its suggested she’s an astronaut (who might have become lost in space). While this series is off to a weak but interesting start, I’m hopeful this new month will put the first season to where it needs to be, full of adventure. “Escape to / from Atlantis” and “The Living Mummies of Toth-Ra” sound promising. Both will inject the needed elements back into the show. Also the latter may well be the defining tale as I have fond memories of the original series opening sequence featuring the lads about to get a crystal, only to have a corpse rise to claim it himself! New series creators Matt Youngberg and Francisco Angones did mention how this series is for a new generation. Being an older fan, I’m tied to my appreciation for the classical material. While I will tune in from time to time to see where the story will go with Della, I’m thankful I have the DVDs of the original show to fall back to. If this reboot fever the studios have is going to continue, I want to throw this idea to Disney — bring back Gargoyles! They will have to hire Greg Weisman to work with the new team (or old) to revisit the gang 25 years later (this anniversary is coming in 2 years time) or reboot that with different tone. Yes, the fandom will complain but this particular product needs the love it never got when it was shuffled from one partnering network to another, and was always preempted because of all those Saturday morning sports events.